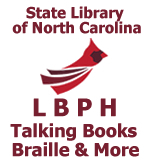 The library has just produced a brand new all audio version of the 2019 Descriptive Video Catalog. The catalog is a collection of all of the DVD’s available today from the library. It is available from NOBLE as downloadable digital talking book so you can listen to it on your Digital Talking Book Player and from our Descriptive Video page on the website as a now playable MP3. Listen Now – Descriptive Video Catalog and order a movie today. This entry was posted in collection, News, NOBLE, Videos and tagged audio, audio description, blind, descriptive videos, dtb format, DVD, fun, libraries, library, library catalog, listen now, local recordings, low vision, movie catalog, movies, mp3 audio, NC LBPH, nc libraries, North Carolina, north carolina library. Bookmark the permalink.